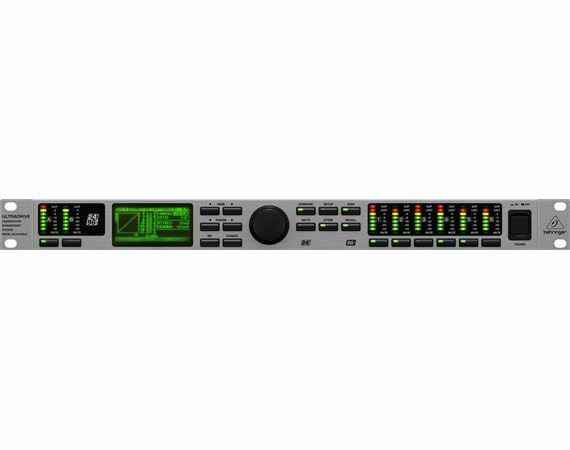 Shop Behringer DCX2496LE UltraDrive Loudspeaker Management System from AMS with 0% Interest Payment Plans and Free Shipping. The Ultradrive DCX2496LE is the answer to making your venue sound like it was tuned by the pros. Over the past years the DCX2496 has become an industry standard and several hundred thousand units have been employed in high-end touring as well as install applications. The new DCX2496 “LE” version offers the same impeccable audio performance as the original DCX2496, but with reduced functionality as many customers do not require the digital inputs and outputs of the standard version. The DCX2496LE is the perfect way to manage a multi-speaker sound system in any sized venue – from cinema to sanctuary to concert hall. Featuring 2 inputs, 6 outputs and 24-bit/96 kHz high-end AD/DA converters, this state-of-the-art processor will take your system to the next level and beyond. With 2 analog inputs and 6 analog outputs on servo-balanced, gold-plated XLR connectors and four different mono and stereo output operating modes, you get maximum flexibility in just one rack space. Superb high-end Cirrus Logic 24-bit/96 kHz AD and DA converters give you ultimate signal integrity and an incredible dynamic range. The ULTRADRIVE’s sleek design, with its high-power 32-bit Analog Device* Sharc DSP, ultra-high resolution 24-bit/96kHz Cirrus Logic AD & DA converters and maximum processing power provide outstanding audio performance, helping you get the most out of your sound system – no matter where the gig takes you!